Once upon a time, in a kitchen not located anywhere near mine, there was a mom who didn’t much feel like making dinner. So she picked up a rotisserie chicken from her local grocery store and served it to her family along with a Caesar salad prepared from a bag. After dinner, she felt a little guilty for being so lazy, so as penance, she decided to scavenge every last scrap of meat off the carcass so that she could use the leftovers to make her sister’s Famous Chicken Tortilla Soup. Now I’m not saying that this ever happened in my house, but if it did, what would have happened next is that I would have found the wishbone of the chicken in my scavenging and decide to use it as a Teachable Moment. After carefully cleaning and drying the bone, I would have called my daughter into the kitchen and asked her if she knew what it was. After a bit more cajoling, my hypothetical self would have realized that there was no power on Earth strong enough to convince my hypothetical yet oddly still strong-willed daughter to break that wishbone. At least, not until she understood fully what the chicken had used it for and not until we had made a proper plaster cast of it, at which point, she would consider allowing me to take a surgical slice from it so that she could inspect the marrow under her magnifying glass (even my hypothetical self has not yet given in to my daughter’s demands for a laboratory-grade scanning electron microscope). So I handed her the wishbone for a closer examination and prepared to ask the iPhone. What are wishbones really for? 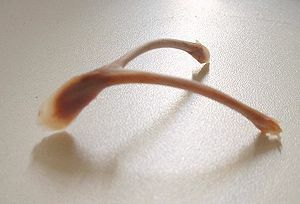 A hypothetical website called Wikipedia informed me that the wishbone in my hand was the bird’s clavicles–fused together to give the chicken’s skeleton the extra strength it needs for flight. Many theropod (meat-eating) dinosaurs had wishbones, including Tyrannosaurs, Allosaurs, Velociraptors, Oviraptors, and Troodons. The fact that these dinosaurs had a wishbone turns out to be one of the main reasons scientists think there is a close link between dinosaurs and birds. My daughter thought it was really cool that she was holding in her hands some of the evidence proving a link between her favorite theropods and modern birds. She immediately wanted to add it to her collection. I was less keen on the idea, as frankly, rotisserie chickens are a fairly commonplace sight in my kitchen and whenever she wanted to review the evidence, I would happily bring home another one. At which point, my husband came into the kitchen and put his foot down. But that’s a question for another day. Preferably one on which “hypothetical” means what I think it means.